On Second Scoop: Ice Cream Reviews: Why must the resolution gods taunt me? Why must the resolution gods taunt me? It's really hard to focus on portion control and smart eating when you walk by stuff like this. I don't care that it's twenty bucks or that it has ice crystals on it, I want it, and I WANT IT NOW!! Oh it looks so good!! I was in Walmart last night when I spotted this. I also had a thought while I was there. I overheard three things while wandering through the ice cream aisle. "But I don't really like mint"
"How am I suppose to start my diet if we keep buying this stuff"
"no no, I should put it back, I don't need it"
Ok, that first statement doesn't mean much, but the other two do. From time to time, I do feel a little guilty in the fact that I taunt everyone with these awesome looking treats. I know that you are in control of your own destiny and no one forces you to eat what I talk about, but.... well, it wouldn't hurt if I tried to help. Heck, I'll admit that after seven years of being the same weight, something snapped and I put on ten pounds last year. My goal for 2012 is to ditch those ten pounds but not through dieting. Dieting is an evil word. No no, I'm going to get back to portion control. I've been too lazy with how much food I grab. I don't need two handfuls of chips, one is plenty. And I don't need 3 servings of ice cream, 1+ needs to do for now. Look, giving up your favorite treats isn't going to help you lose weight long term, but that doesn't mean you can't choose smart. While a Klondike bar may set you back 270 calories with a whopping 140 from fat, A Klondike Oreo sandwich is 200 calories with just 60 from fat. Next spread things out, have that Oreo sandwich every other night, or every third night is better. Do a sherbet or froyo on night 2, and night one can be pretzels or something. Ok, I'm probably rambling, but the point is don't give up and don't go cold turkey. Pace yourself for long term change. Sure you can cut your daily calorie intake in half, but that won't work long term and just makes you want food more. Trust me.... or don't, make up your own mind, that's the way to go. I actually saw a new ice cream pizza by friendlys while grocery shopping the other day. If my freezer wasn't full I'd definitely would've gotten it. Was it Emack & Bolio's? I saw one of those at Wegman's and I'm going to have to go back for it. Unfortunately, we do not have Friendly's in Minneesota. That cake looks amazing, and I totally feel ya on the resolution thing. No it was made by friendly's. I'll have to tweet you a photo next time I go shopping. That really looks good, but the price tag would have stopped me in my tracks. Did you see the new flavors of Bryers Blasts at Walmart? I noticed four different ones and thought of your blog! 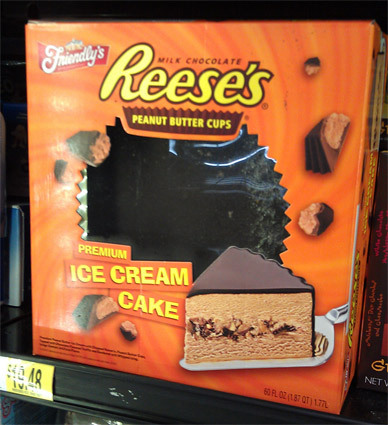 Wow..that Reeses ice cream cake looks amazing!!! God what i would give to try that. It taunts you so you taunt me??? We can't get these in Kansas and they look fabulous. I am now sad. Thanks.